DDB has launched Tango5, an agency which specialises in championing social impact. 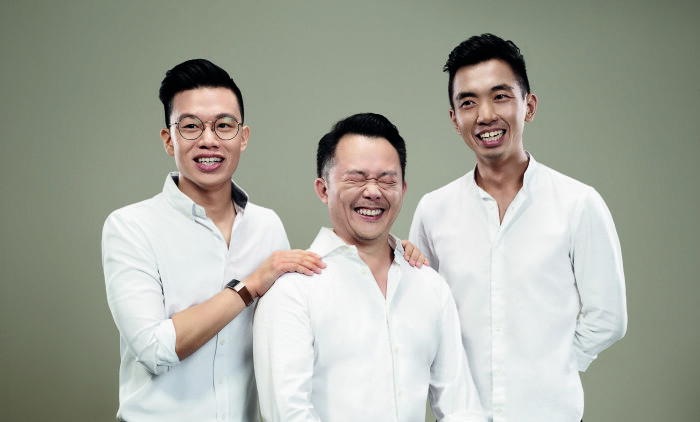 The agency will be jointly-led by its social media creative director Benjamin Lee (pictured middle), also known as Mr Miyagi, Josiah Ng (pictured left), content and experiential marketing consultant, and strategist Koo Ze-hou (pictured right). The new agency aims to drive advocacy work and help organisations achieve greater social impact. It will continue to drive the work DDB has done with clients in the ‘social for good’ causes space in past years. Some work undertaken by DDB in the past includes creating the brand for the National Volunteer and Philanthropy Centre’s (NVPC) corporate philanthropy programme ‘Company of Good’. Other campaigns include ‘Our Better World’ by Singapore International Foundation, along with work with non-profit organisations such as the Breast Cancer Foundation (BCF) and Bone Marrow Donor Programme (BMDP), to boost outreach. DDB has also created a series of original content and orchestrated social media experiments for key clients such as Ministry of Communications & Information (MCI), StarHub, McDonald’s, SilkAir and DBS Bank. Tango5 is expected to lend its expertise for the recent appointment for the Nation Building campaigns by MCCY. Some notable work on social impact DDB and Tango5 have done include social experiment series ‘The Labelled Chair’ and ‘The See-Saw Conversations’, helmed by Ng, which promotes social cohesion between Singapore and foreign-born residents. Others include ‘The Provision Shop’ telemovie for MCI on social integration, StarHub’s ‘Majulah Mums’ and OurBetterWorld by Singapore International Foundation. According to a press statement, Tango5 will build on DDB’s ethos of ‘Creativity+Humanity’, as social impact has grown from a passion for DDB Group, to an in-demand best practice for the agency’s work across its key clients. The move to start Tango5 follows the shift towards consumers showing greater social consciousness and support for brands which are seen as leaders of change. It is part of DDB’s move to offer specialised marketing solutions with its T-divisions as the agency looks to boost its talent pool. It claims to have seen breakthrough growth with digital innovation arm Tribal, shopper marketing arm TracyLocke, portals and e-commerce arm Track and Tasseologic which specialises in data-mining. It recently launched a global tech hub, Equator, in Singapore with the support of the Economic Development Board. “We are keen on social impact – done intelligently, cohesively – for our clients’ marketing. Social has become the most influential media for brands and causes. We are way past producing one-hit wonders and well into creating systemic, long-term social impact. And that means investing in top-class talent with exceptional skills – idea scripting, influence marketing, content production and brand advocacy– for a complete end-to-end offering. Lee, Ng and Koo are the new champions of social impact creativity,” David Tang, CEO of DDB Group Singapore and Asia, said. The move follows a string of other recent initiatives the agency has undertaken, including management changes which saw familiar DDB faces starting up their own independent creative agency Blk J. It was started up by DDB’s Rowena Bhagchandani (managing director), Joji Jacob (group ECD), Khalid Osman (creative director) and Lester Lee (creative director). Simultaneously, DDB hired JWT ECD Chris Chiu, who is joining the team as chief creative officer, while former Y&R MD Melvin Kuek is taking on the role of managing director. Most recently, Guillaume Pagnoux also joined as chief planner to become part of the leadership team helmed by David Tang, Neil Johnson and Jeff Cheong. What’s at stake for F1 in Southeast Asia, if Singapore says no to new deal? SG Story has been officially appointed by Far East Hospitality Management to handle their social media activities for two of their..